Back in March, after deciding that it would be a good idea to erect a bronze and marble statue of Keith in Wiveliscombe, the town where he spent most of his schooldays, Hilary Miller and I began the tricky task of writing a schedule and plan of action. This done, we began the real work: finding references (including reading 3 autobiographies and watching countless DVDs); drawings; costings; deciding funding sources; writing and designing the proposal booklet (see the Proposal) and setting realistic targets. A steering committee was formed in April to oversee fund raising and ensure good practice. 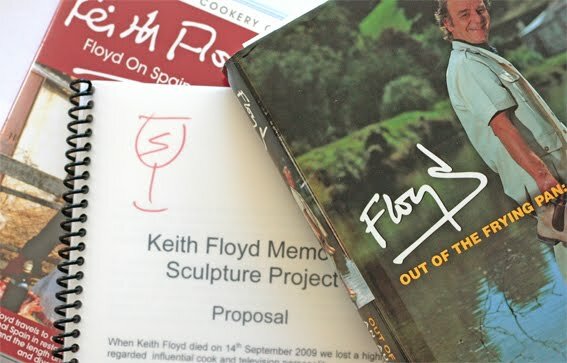 The 'Keith Floyd Memorial Project' bank account was set up. The Proposal booklet was printed and its distribution commenced. Consultations were carried out with local interested parties and a public 'comments' book was lodged in the Wiveliscombe Community Office. County wide newspaper articles have been published and one local radio interview given. A maquette - a one sixth sized sketch model - is in progress and when finished it should help us all to visualise the final sculpture.